Guide to Mexico City´s lesser known neighborhoods, traditional fiestas, public art and open spaces. In 2008, we moved into our apartment in the Colonia (neighborhood) Parque San Andrés in the then Delegación (since 2016 called an Alcaldá, mayoralty) Coyoacán. 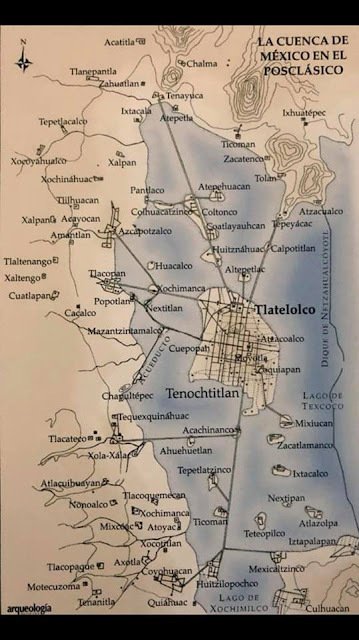 We soon learned that the highway one block to the east, the Calzada de Tlalpan, was the causeway built by the Mexica/Azteca south across Lake Texcoco from their altepetl (city-state) when they won control of the area around the lake from the Tepaneca of Azcapotzalco, on the west shore of the lake in 1428. Hence, the roadway has been in continuous use for almost six hundred years, probably one of the oldest continuously used man-made roadways in the Americas. Certain that much history had to be associated with this causeway-roadway, we made it a goal to discover as much of that history as we could. Metro Line 2 runs up the middle of the Calzada, from Taxqueña, a crossroad just south of us, to the city's Centro, Using it frequently, we early on took note of the names of the stations, as they often provided clues to the neighborhoods they were in or to some historical event that happened in the area. For example, we learned that Estación General Anaya, the station closest to our apartment — and hence our home base for Metro trips — was named after the Mexican general who led the defense against invading U.S. forces in August 1847, near the end of the so-called Mexican-American War. Mexicans view him as a hero because he and his troops fought heroically at the nearby former convent of San Diego (which doubled as a fortress) until they ran out of ammunition and were forced to surrender. Also named after him are a street passing the convent and a nearby colonia, in Delegación/Alcaldía Benito Juaréz just to the north. The next station north, just over the border in Benito Juárez, is Ermita (Hermitage), the name, as well, of a small colonia nearby. This seemed to indicate that there had once been a hermitage, a small chapel for prayer and meditation, somewhere in the area. We also learned that it was where the channel carrying water from Lake Xochimilco, to the south, discharged into Lake Texcoco. Thus, it was a strategic place for the powers that were in place to control traffic between the two lakes. Seeking easy access to the southeast part of the Valley, the Mexica divided the causeway at this strategic point into two roadways: one westbound to Coyoacán, a major center in the southwest of the Valley, and the other eastbound to Mexicaltzingo, on the tip of the Iztapalapa Peninsula. The eastbound causeway is now the Calzada Ermita-Iztpalapa, a major roadway that crosses all of Delegación/Alcaldía Iztapalapa to the State of Mexico. Ermita was, and remains, at the crossroads. However, we were unable to find any reference to the existence of a hermitage at this spot, let alone any physical remains. with Tenochtitlán of the Mexica in the center. together with most of their subordinate villages. and took control of the entire area around Lake Texcoco. to make access to their dominion easier. From the magazine Arqueología méxicana. The title says it portrays the Basin (Valley) of Mexico, but it does not. by far the largest of five lakes in the Valley. Then, just recently, the entire story of la Ermita appeared out of nowhere, as such treasures often do, on one of the Facebook Pages that we follow relating to the history of Mexico City. We present our translation of the post in its short entirety, along with a priceless photo of what remained of the hermitage about one hundred years ago. of the latter part of the 17th century. The hermitage or small chapel, known as the Chapel of the Souls or Zacahuitzco (name of a nearby barrio on the island of Iztacalco), functioned as a visita, a chapel served by the parish priest from a nearby parish. It was created as a place to say Mass for souls in purgatory. According to a Royal Pronouncement now kept in the National Archives of Mexico, in 1645, Don Garcia Sarmiento Miguel de Mora, Count of Salvatierra, a resident of Mexico City, asked the Archbishop of Mexico to build a chapel on the Iztapalapa Calzada. It states that the count asked the Archbishop that, "in the service to God our Lord", Masses be said there for the souls in purgatory. It states that he was given permission to construct such a hermitage dedicated to the Virgin of the People where the Calzada de Tlalpan, which the Spanish had extended south to the towns of Tlalpan and Xochimilco, intersected with the roads to Iztapalapa and Coyoacán. 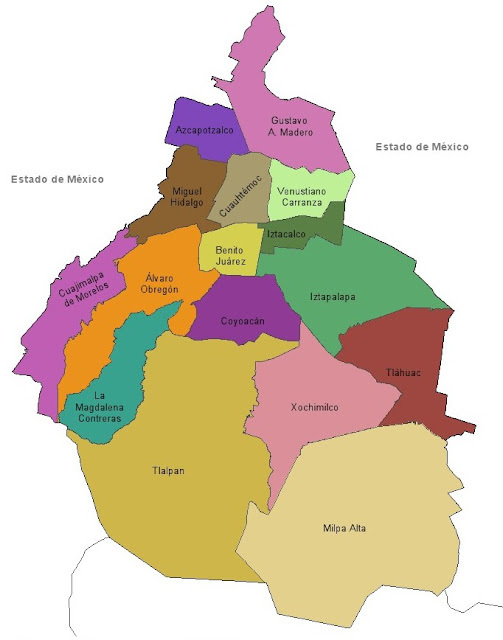 It is unknown at what time the name was changed to San Antonio, but it is attributed to the fact that one of the old neighborhoods of the nearby town of Iztacalco is San Antonio Zacahuisco. Apparently la Ermita was abandoned by the beginning of the 20th century, and it remained in a dilapidated state until the 1940s, when it was destroyed as the Calzada de Tlalpan was widened (into an eight lane highway with an electric tram line up the middle). It remains now only as the name of a colonia, a Metro station and the Calzada Ermita-Iztapalapa roadway. Photo: Attributed to Manuel Ramos, CNMH-INAH (National Coordinator of Hisotric Monuments of the National Institute of Anthropology and History), taken from the book "Delegación Benito Juárez, Images from the Memory of María de Jesús Real García Figueroa". Provided by the Facebook Page Red de Cementerios Patrimoniales del Centro de Mexico (Network of Historic Cemeteries of the Center of Mexico), shared by the Facebook Page of San Bartolo Atepehuacan Xipe Tótec, a pueblo we have visited, which was originally an island north of Tenochtitlan (see map above). 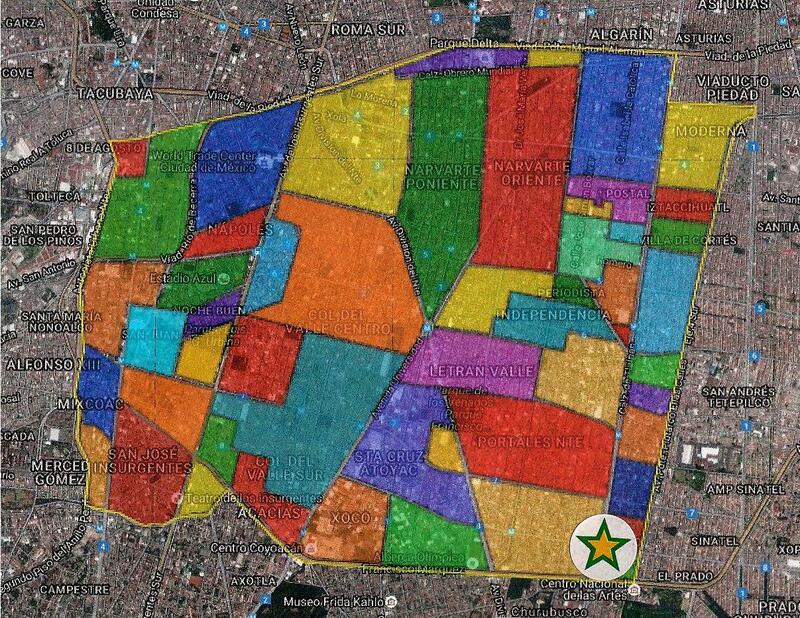 The intersection of roadways where la Ermita stood is at the center of the green/yellow star. The Calzada de Tlalpan runs north to south. running east from the center of the star. Colonia Ermita is the green area peeking out from the bottom, right point of the star.